Our web editors send Elektor's e-zine to you every Friday, making sure it is packed with the latest news, Elektor Labs projects, videos, downloads, tips & trends from the world of electronics. Additionally, you will be quickly and comprehensively informed about current and upcoming Elektor projects, as well as the extensive range of special Elektor products, before anyone else! Sign up now and get a Free Raspberry Pi e-book! Sign up today and get the Raspberry Pi Compilation 2 e-book worth €9.95 (£8.95 / US $12) completely FREE! 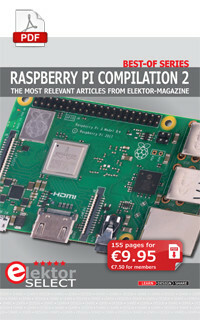 This ebook (155 pages) contains 28 Raspberry Pi articles published in Elektor Magazine. Subscription to this newsletter can be cancelled at any time. Just click on the appropriate link that you will find at the bottom of every edition.